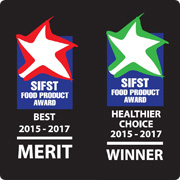 Naturel Organic Mixed Rice was conferred three awards by the Singapore Institute of Food Science & Technology (SIFST) Food Product Awards (2015 – 2017). Special Mentioned Certificate Award for Sensory Appeal. These awards recognised food companies for their outstanding products and in response to the increasing health consciousness and growing discernment in the consumer’s choice of food.